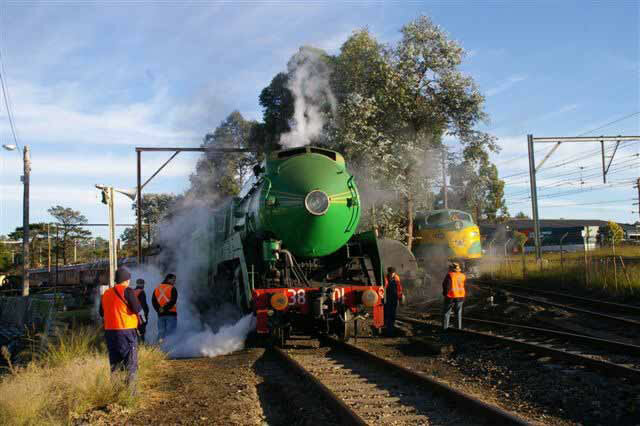 After many months of planning with our parent body, the NSW Rail Transport Museum which included many long hours of hard onsite labor and some long late nights by our volunteers, steam returned to the Mountains with the arrival of locomotives 3526 and 3801 at Valley Heights on Friday 25th May 2007. The locomotives and their train which comprised of two SWT water gins and the VHO crew van arrived in the Down Refuge Siding shortly after 2pm. Upon arrival the two locomotives detached from their train and ran around their consist via the Down Main to the Sydney end of the train. 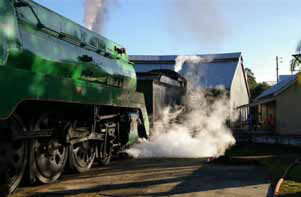 The 35 and 38 then shunted the train into the Museum stabling the cars in the Departure Road for the evening. 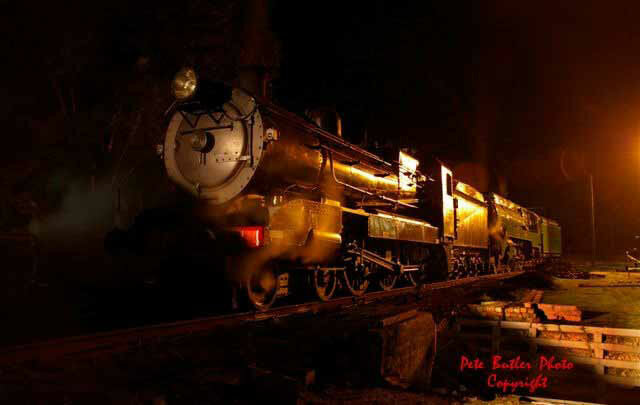 The locomotives then moved to the turntable for coaling and watering. It was during this time that the Museum opened its doors for the public giving visitors the opportunity to inspect the locomotives up close. While visitor numbers were not high, those who took the opportunity enjoyed the experience. Once watering and coaling was completed, the locomotives reversed back to the Ash Pit where the locomotives fires were cleaned. As the sun set for the day the locomotives were stabled at this location for the evening, the RTM boys cleaned up and adjourned for a well earned meal while the Valley Heights members patrolled the Museum. All was set for a weekend of steam magic. soon after the locomotives arrived. lead up to the weekend and in the week following the event. VHO Van into the Departure Road. coaled before both were serviced over the Ash Pit. to the public on Friday 25. Arrival Road where most servicing took place. The weekend provided us with chances to record rare photographic opportunities. in readiness for Saturday's duties. All shuttles were hauled using motive power at both ends of the train. Here 3526 is seen entering the Down Refuge while bringing up the rear of the train after returning from a successful day of Mt Victoria shuttles. Saturday saw two different roles for each locomotive. 3526 was chartered to provide steam shuttles in conjunction with the festivities of the Mt Victoria Great Train Weekend while 3801 re-enacted the Central West Express taking Passengers to Orange for the Day. Heritage Diesels 4306 and 4201 arrived from Sydney with a 9 car train. 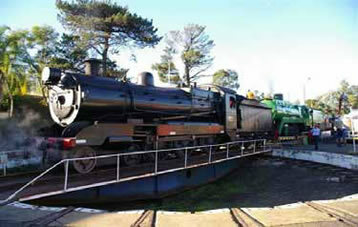 Upon arrival the train divided into two and the steam locomotives reversed onto the train and departed for Katoomba with passengers traveling to Orange. 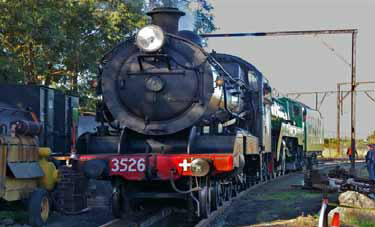 At Katoomba, 3526 detached from the train leaving 3801 in charge of the train to Orange. 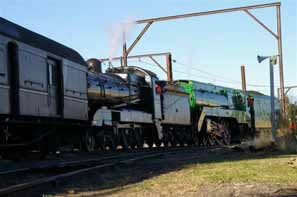 4306 and 4201 followed the first train with the cars for the steam shuttles between Katoomba and Mt Victoria. While the shuttles were a success and the 35, 42 and 43 class returned back the Valley Heights on time that afternoon, unfortunately the same cannot be said for 3801. On the return journey from Orange, 3801 and her train were held at Bathurst for 2 hours, (despite arriving at Bathurst only 2 minutes behind their scheduled arrival time), to allow a freight train in front of the 38's path and for the XPT to cross. Consequently, the 38s return to Valley Heights was two hours late. However that was not the end of the problems. Upon arriving back at Valley Heights a points failure in the yard during the changing of locomotives delayed the train for a further 60 minutes resulting in a very long day and late arrival back in Sydney Terminal for the Orange train passengers. The heritage diesels arrived back at Valley Heights with the empty train about 2am. 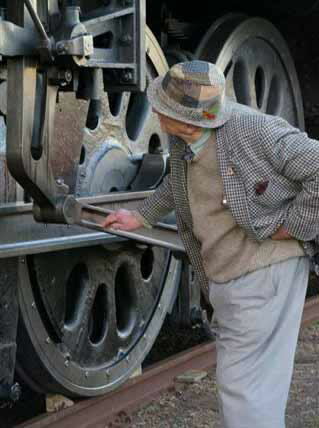 Shunting was required in preparation for the Sunday events before the crew could retire for the night. Most of the crew was required to back up again on Sunday. Crossing the Nepean Bridge en-route for Valley Heights. 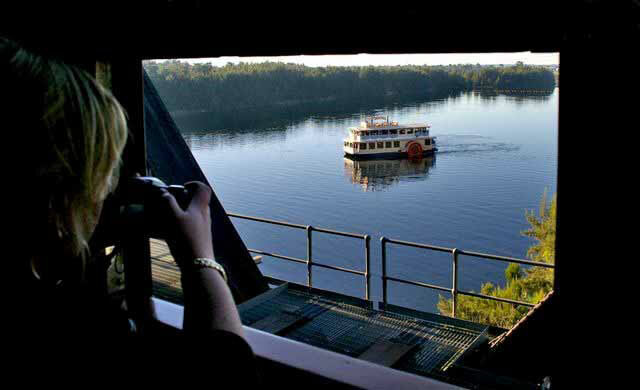 The train pauses on the Nepean River bridge as part of the centenary of the bridge to, allow for passengers aboard the Nepean Belle to view and photograph the special train crossing the 100 year old landmark. After a very long and eventful Saturday for RTM crews, all the action diverted to Penrith and the centenary celebrations of the railway bridge across the Nepean River. 3801 & 3526 operated shuttles from Penrith to either Valley Heights or Blacktown. Tickets for the shuttles went on sale at Penrith Station at 8:30am and by 9:15am the first shuttle to Valley Heights was sold out. This remained the trend with all the Valley Heights shuttles selling out well in advance of their departure time. Unfortunately the Blacktown shuttles were not very well patronized. The centenary of the railway bridge was a focal point for locals, with the Nepean Belle and Nepean Rowing Club also providing opportunities for locals to celebrate the occasion and witness and photograph the special trains crossing and pausing on the bridge. Following the success of a steam filled weekend an impressive train comprising of locomotives 4201, 4306, 3801, 3526, two SWT Water Gins, VHO Crew van and 9 passenger cars (including Sleeping Car EAM1829) departed Valley Heights for Thirlmere soon after 10.00am. Monday 28th May 2007 saw the weekend come to a close 3801 and 3526 together with 4201 and 4306 (in the coal stage siding) bathe in the early morning sun awaiting clearance to join their train in the Down Refuge before their ultimate departure for Thirlmere. To all the Valley Heights Members & RTM crews associated with the operation of the weekend, a big thank you for your contribution to the overall success to the weekend. All Photos courtesy of Peter Butler. Page Updated: Wednesday, 07-Nov-2018 13:34:19 PST.